A walk to restore your faith in the "little tops"
On entering Mountshannon from Scarriff I turned left at a house with large white pillars GR R 70792 86973 A. Continuing uphill for approx 5km there is roadside parking just after a rusted little sign for a Dolmen GR R 67553 89807 B. Following the road north from here on foot it soon becomes an unpaved track leading you into a beautiful if desolate bog landscape. Approx 2km from the car watch out for an overgrown track on your right leading into the bog cuttings GR R67018 91762 C. This rough track peters out after a short time. Continue ENE across the bog towards the high ground, first reaching a cairn and shortly after the summit trig point sitting on a slight grassy mound. The visibility wasn't the best on the day but nonetheless I had good views of Tountinna and Lough Derg and the company of skylarks and a lone cuckoo. A good to be alive moment! 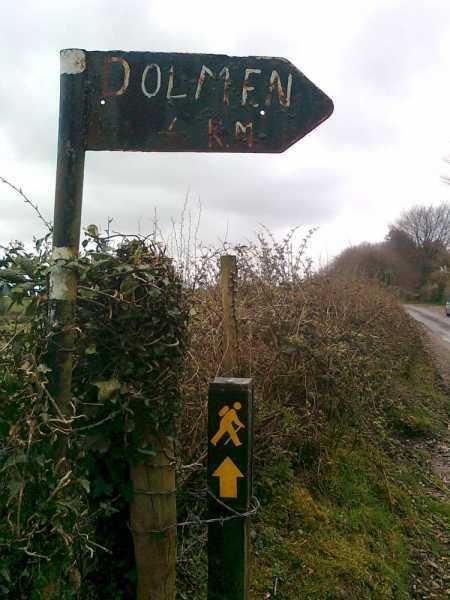 Upon retracing my steps to the car I was intrigued by the battered sign and went in search of the Dolmen. Following the direction it pointed I went along a bog road for almost 1km to find the dolmen just slighly off the track to the left at Gr R 67749 90610 D. This is a great little track with extensive views of Lough Derg and Holy Island. With a little bog trotting it could be incorporated into a loop taking in both the dolmen and Cappaghabaun.